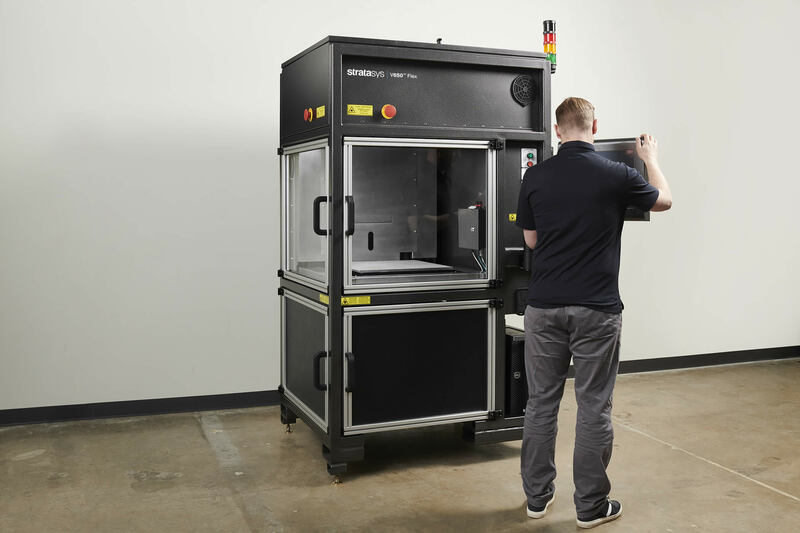 Stratasys, the additive manufacturing quality and reliability leader, has announced a new 3D printer to their list of product offerings. The new V650 Flex is the first ever Stratasys 3D printer featuring Stereolithography (SLA) technology. 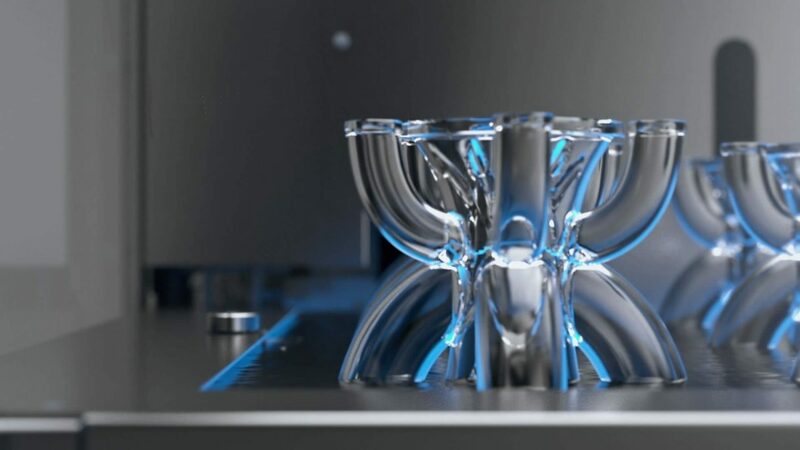 Stereolithography is a form of 3D printing technology used for creating parts layer by layer, by projecting an ultraviolet (UV) laser onto a vat of photopolymer resin. Photopolymers are sensitive to ultraviolet light, so the resin is photochemically solidified and therefore forms a single layer of the part. Then the build platform lowers one layer at a time while a blade re-coats the top of the tank with resin. This process is repeated for each layer of the design until the 3D object is complete. Completed parts must be washed with a solvent to clean wet resin off their surfaces. The V650 excels when it comes to single material large parts and is useful for prototypes for design validation, casting patterns and injection molding. Closed systems currently on the market are restrictive when it comes to variety and cost of materials. The open system Stratasys V650 SLA printer offers reliability, high print quality, large part production and versatility when it comes to choosing the materials best suited for your for needs. Productivity isn’t an issue since this industrial machine is designed for 24/7 operation and built for reliable production that’s backed by Stratasys service and resin supply. Somos Watershed XC 11122: Low viscosity liquid photopolymer that produces strong, tough, water‐resistant, ABS‐like parts. Most importantly, parts are nearly colorless, and look more like clear engineered plastic. Somos PerFORM: Medium viscosity liquid photopolymer that produces strong, stiff, high temperature resistant composite parts. Material of choice for applications such as tooling and wind tunnel testing. Somos Element: Next generation liquid photopolymer specifically designed for producing investment casting patterns. Antimony‐free leaving only trace amounts of ash residue following burnout. Somos NeXt: Extremely durable liquid photopolymer that produces accurate parts with high feature detail. Facilitates the production of tough, complex parts with improved moisture resistance and greater thermal properties. For over 30 years Stratasys has been pioneering 3D Printing technology. The Stratasys product line ranges from small desktop 3D printers to full production machines. Stratasys also offers end-to-end production of 3D printed parts and offers different technologies and materials such as FDM, Polyjet and now SLA, to be suitable for any industry or application. Stratasys 3D Printers play an important role in countless industries, including Medical, Automotive, Aerospace and Mold, Tool & Die. 3D Printing reduces the length of the prototype model process and reduces tooling costs and re-work. Adam Ferrer is a student at McMaster University taking the Bachelor of Technology Automotive and Vehicle Engineering Technology degree program. He is currently on an 8 month work term with Javelin.